Going through a personal bankruptcy can be a very stressful experience. When you are going through a bankruptcy, one of the biggest concerns will be what will happen to your assets, liabilities, and future financial well-being. One of the first decisions that you will have to make when you are going to declare bankruptcy is whether or not you should hire an attorney. 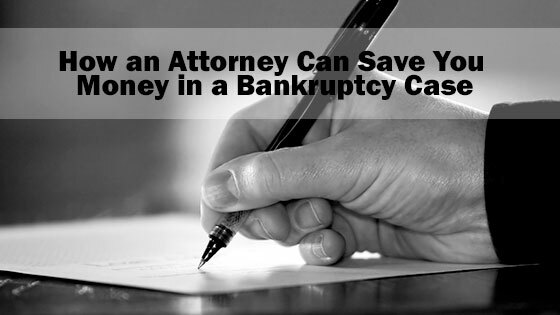 While you may be concerned about the costs and expenses that come with hiring a bankruptcy attorney, these lawyers can provide you with a lot of services and benefits that could end up saving you a lot of money in the long run. When you hire an attorney to represent you during a bankruptcy, the first thing that they will do for you is provide you with a free consultation. If you are in a difficult financial situation, it may seem as if declaring bankruptcy is the best option for you. While there are many situations in which declaring bankruptcy makes perfect sense, there are some situations in which people may be better off pursuing other options. An attorney will be able to review your personal situation and will provide you with guidance. This might include coming up with another financial plan that could be more advantageous for you. One of the main reasons why you should hire an attorney when you are going through bankruptcy is that they will be able to help you to eliminate some of your personal liabilities. If you determine that filing Chapter 7 is the best option for you, the attorney will be able to work with creditors to ensure that your personal liabilities are completely waived in accordance with the bankruptcy ruling. This could help to give you a fresh start. If you determine that filing for Chapter 13 is a better option for you, the bankruptcy plan will require that you enter into some form of a repayment plan. While this may not seem too beneficial, the repayment plan almost always will come with a lower interest rate, extended repayment terms, and even forgiveness of some debt. This will help to ensure that your payments are lower and more affordable for you. While the bankruptcy lawyer will be able to eliminate some of your personal liabilities, they will also be able to protect some of your assets. Generally speaking, when you file Chapter 7, you will be required to liquidate some of your assets. This can include liquidating any assets that you have in bank accounts and selling any other highly liquid assets, such as stocks and bonds. While some asset will have to be liquidated, your attorney will do their best to protect some of your personal financial assets. Some of the assets that your attorney can help you to protect can include your personal retirement accounts, home equity, and future guaranteed income through pension plans. This could ultimately save your thousands of dollars. Finally, the attorney will be able to ensure you are being treated fairly by the credit agencies. The attorney will work to ensure that your bankruptcy is being fairly recorded by the major credit bureaus. While the bankruptcy will remain on your report for some time, there will come a time in which it should be removed. In these situations, the bankruptcy should be fully cleared from your credit report. This should then allow you to take full advantage of having a cleared credit report, which will include being able to qualify for personal loans and take advantage of better interest rates on these debt products.